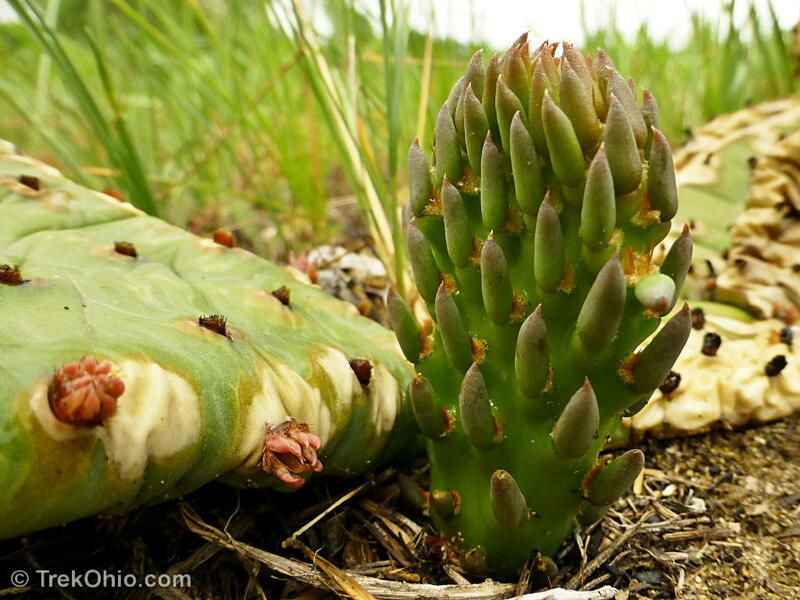 When you think of a locale for cactus, Ohio doesn’t generally spring to mind. Texas perhaps, certainly Arizona, but not Ohio. 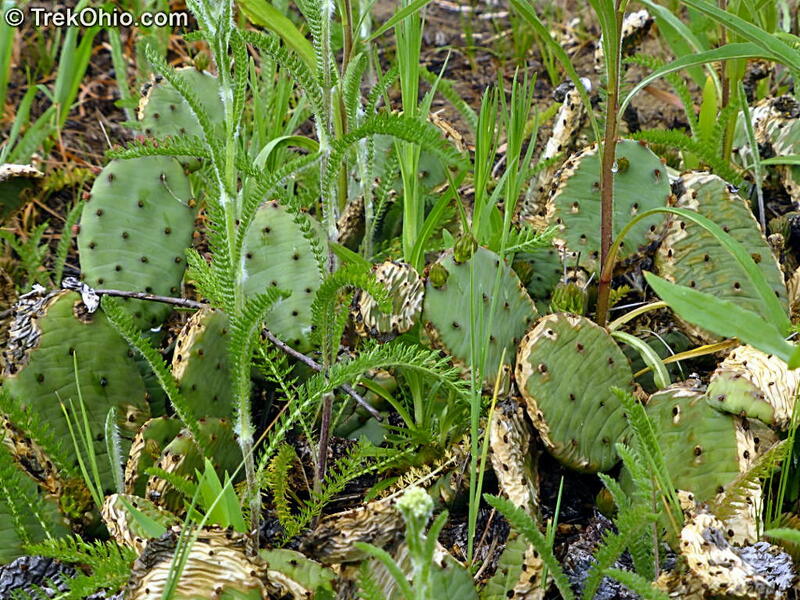 Yet there is a species of cactus that not only grows in Ohio, but is native to the state. Eastern prickly pear cactus (Opuntia humifusa) is native to Ohio growing in sandy soil in a few select places in northwest and southern Ohio. Deb and I lived in Austin, Texas for several years and frequently saw prickly pear cactus. It never occurred to us we’d find it in Ohio. But on a recent trip to the northwest near Toledo, we visited Kitty Todd Nature Preserve and saw prickly pear growing in patches in the wild. 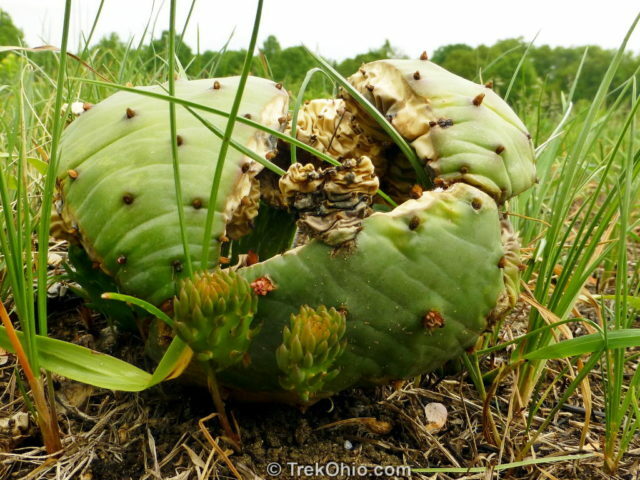 Naturally I wondered, how can prickly pear survive cold winter temperatures in Ohio. The USDA site states: “Eastern prickly pear is winter hardy, being able to survive on sites where the minimum winter temperatures can drop below 10°F (-12°C). The cactus avoids freeze damage by rapidly reducing the water content in cells during cold acclimation”. The Kitty Todd Preserve is in an area of Ohio called “Oak Openings”. 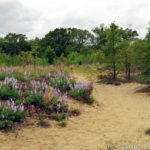 I described this area in a recent post about nearby Oak Openings Metro Park (where prickly pear is also found). There are sand dunes found here that are remnants of barrier islands of an ancient lake. And eastern prickly pear cactus grows quite well in this sandy soil. We visited in May, but the best time to go is in June, when the prickly pear is in bloom. 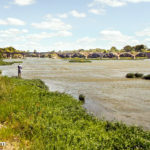 See the links at the bottom of this post for an article by botanist Andrew Gibson. His article includes photos of the flower. 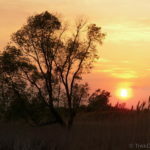 TrekOhio: Lucas County Parks & Preserves; links to preserves where prickly pear can be viewed in the wild, such as the Oak Openings Metropark and Kitty Todd. USDA: Opuntia humifusa — This is the scientific name for eastern prickly pear cactus. Share the post "A Native Cactus of Ohio"
Are these the type you can eat like a fruit? 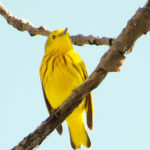 Where is the best place in Oak Openings to see them (largest numbers)? I heard southern Ohio also has some populations. Where are those? In Adams County, there are native cactus at Sandy Spring Cemetery. Kyle Brooks did a nice article about Adams County cactus. That is a nice picture. I have never been to Kitty Todd Preserve but I have seen Cactus growing wild in Oak Openings Metropark nearby. I used to pass a house on my daily commute to work. One day I noticed they had a palm tree growing in their yard. A palm tree in Ohio – very strange. A few days latter I drove by slowly and noticed it was in a large wooden planter on wheels. Towards the middle of fall, it disappeared (presumably taken inside) and re-appeared in the spring. i did not know we have a native catcus here in ohio, neat, I have some growing outside in my flower bed I planted some pads this spring, my hubbys mom gave me some, too while I was out in the ministry work I was at a house where they have the most beautiful prickly pear bed i ever seen in ohio or anywhere (except arizona when i was there) it was beautiful and I wanted one, so when tony’s mom gave us some wow, I said I hope they will grow and spread and sure enough they are growing and getting new pads, I had to cut some of the weed guard around them so hopfully this will help them spread, I must have alot of sand in the soil because they are doing really well, in fact we live on a sand and gravel pit (some guy before us wanted to start a sand and gravel pit business but the city said no.